Lake Fayeteville Trail is mostly level with some short climbs. The trail surface is hard packed with very few rocky sections. It can be ridden in either direction. Lake Fayetteville is visible from about half of the trail, making this a very scenic ride. Expect to encounter other bikers, as well as walkers & joggers. Review: Giving this trail 4 stars for what it is in the category it fits in. Nice beginner XC trail that can be ridden by riders of any experience on any level of bike. It is mostly flat with some small rocks and small roots. The only features that might be considered TTF's are a handful of banked turns on the north side. This is a nice forest trail within the city. If doing the complete loop around the lake, you will be required to ride some paved path near the dam. An option is to turn around near the dam and ride the single track back the other direction. Not a destination trail, for sure, but if you happened to be close by and want a quick, pleasant getaway, or quick workout, this fits the bill. It is a bidirectional trail, but based on the banked turns mentioned above, it makes more sense to ride it counterclockwise, as the banked turns are ridden downhill when riding counterclockwise. The park this trail is located in seems to be pretty popular, and while there was a lot of traffic on the paved path in the park, there were only a handful of mountain bikers and one trail runner on the single track. I started and ended in the Veterans Park parking lot. I rode this trail after a night of rainfall. It drains very well, and wasn't tacky by morning. There were a couple of muddy spots and a handful of puddles, but pretty much dry with no tire clogging. Very ride-able after recent rainfall. 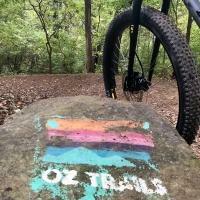 Review: Fun beginner friendly trail. Mix of asphalt and single track with just enough challenges to make it fun. Relatively flat on the north side of the lake. More elevation change on the south side of the lake. Review: Fun easy singletrack. You will need to watch out for trail runners and walkers mostly on the Veterans park side which is on the south side of lake Fayetteville. 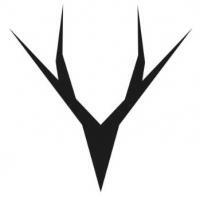 Review: Very good long endurance trail. Great for timing yourself. Review: This is a fun, scenic ride. Once we figured out the layout after a lap we did another riding all the additions we missed the first time. Good use of the terrain. Direct access from the greenway is an added bonus. Review: This is now a gem of a trail thanks to the OORC, great flowy singletrack right in the middle of town! 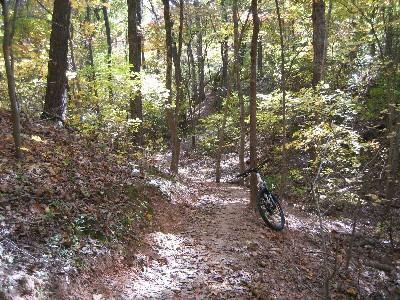 Review: I rode this trail years ago when it was a very basic circle around the lake. Then some flat switchbacks were added on the north side of the lake for added length, and now the new addition of more trails that resemble true modern single-track on the south side that follow the contours of the land rather than just cutting across and or following fall lines like older less well designed portions of the trail that tended to wash out with rain runoff. This trail is much better than it used to be, but if the north side portion had banked turns rather than flat switchbacks so you didn't tend to slide out on dusty corners this trail would be 5 stars in my book. Review: Fast and flowy but lots of people can really be a damper on the ride. Nothing really technical especially with the new additions and routes. It's best after a rain and in the morning before anyone gets there. Review: This trail is nice, especially if you live nearby. It is accessible from many points now and as MKR has stated some improvements have been made in the past year. Be prepared to encounter other bikers and the occasional pedestrian.---Although, a lot of this has stopped with the addition of a paved sidewalk that circles the lake. Something that I would like to see is additional improvements to the section between Veteran's Park and the Botanical Gardens. This area has become somewhat overgrown in a few areas and much of the trail elsewhere has been lost due in part of the paved sidewalk. Review: We ride this all the time after work. Fun little trail. Nothing technical about it. Takes me about 25 minutes to do a 6 mile loop. It's been changed up quite a bit over the past year and some fun features have been added. Lake Fayetteville Trail MTB Trail 3.75 out of 5 based on 12 ratings. 12 user reviews.